Little more than a decade ago, the United States imported much of its natural gas. Today, the nation is tapping into its own natural gas reserves and producing enough to support most of its current needs for heating and power generation, and is beginning to export natural gas to other countries. The problem is, there currently are no cost-effective ways to do this. Methane, the principal component of natural gas, is rather inert and requires high temperatures to activate its strong chemical bonds; therefore the practical and successful conversion of methane to useful chemical intermediates has thus far eluded chemists and engineers. 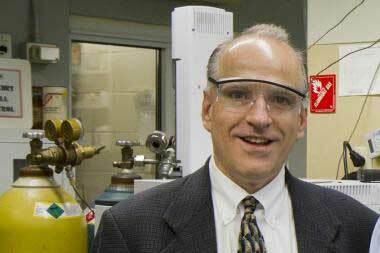 Neurock is working with colleagues at Northwestern University to invent novel ways and catalytic materials to activate methane to produce ethylene. This week the collaborators published a paper in the online edition of the journal Nature Chemistry detailing the use of sulfur as a possible “soft” oxidant for catalytically converting methane into ethylene, a key “intermediate” for making chemicals, polymers, fuels and, ultimately, products such as films, surfactants, detergents, antifreeze, textiles and others. Neurock said that sulfur or other “softer” oxidants that have weaker affinities for hydrogen may be the answer, in that they can help to limit the over-reaction of methane to carbon disulfide. In the team’s process, methane is reacted with sulfur over sulfide catalysts used in petroleum processes. Sulfur is used to remove hydrogen from the methane to form hydrocarbon fragments, which subsequently react together on the catalyst to form ethylene. Theoretical and experimental results indicate that the conversion of methane and the selectivity to produce ethylene are controlled by how strong the sulfur bonds to the catalyst. Using these concepts, the team explored different metal sulfide catalysts to ultimately tune the metal-sulfur bond strength in order to control the conversion of methane to ethylene. In 2007, Dow issued a “Methane Challenge,” seeking revolutionary chemical processes to facilitate the conversion of methane to ethylene and other useful chemicals. The company received about 100 proposals from universities, institutes and companies around the world. In 2008, the company awarded major research grants to Cardiff University and Northwestern University to advance the quest. Neurock is a member of the Northwestern University team. He is using theoretical methods and high-performance computing to understand the processes that control catalysis and to guide the experimental research at Northwestern. Neurock’s co-investigators on the Nature Chemistry paper are Qingjun Zhu, Staci Wegener, Chao Xie and Tobin Marks of Northwestern University, and U.Va. colleague Obioma Uche.